Make your own hijab and combine faith with fashion, the perfect way to show off your individuality. 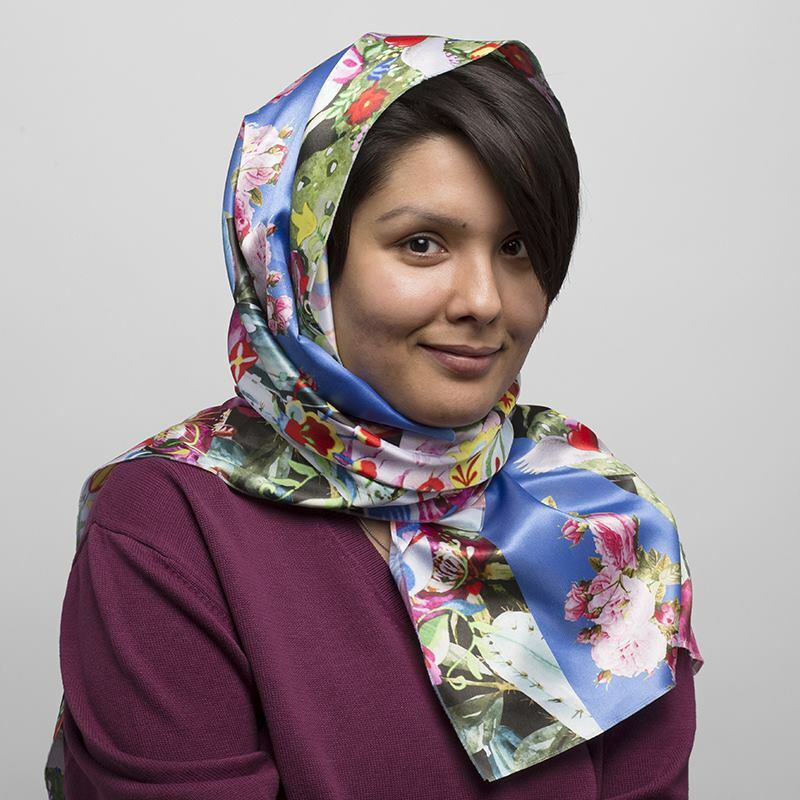 Available in 5 gorgeous fabrics and printed with your own photos or designs, the personalised headscarf is a totally unique concept that allows you to customise your daily style without compromising your beliefs. these printed and handmade hijabs currently come in 4 sizes. From gorgeous silk to elegant chiffon, these custom printed hijabs look great, feel great and allow you to show off your personality along with your faith. You get to choose from 5 gorgeous fabrics, both natural and polyblends, each producing a different but equally stunning finish. We print your designs edge to edge in full colour, permanent print, ensuring your personalised headscarf is a wardrobe staple for years to come. Currently available in 4 sizes, you can make your own hijab for children and adults alike. Handmade by our expert seamstresses, hijabs printed with your own unique designs are a beautiful gift for yourself or a loved one. We use a specialist printing technique that fuses the ink deep into the fibres of the fabric, creating a permanent print so your designs won't fade. We finish the edges with a hemming style of your choice, either baby hem or 3-thread overlock. Baby hem uses 8mm of material on each side, folded twice then a top stitch approximately 2-3mm from the edge. The 3 thread overlock trims off 3mm fabric, and has an overlock edge stitch. Guarantee: 3 year guarantee on fabric structure on all materials. 3 year guarantee for permanent colour. Do You Have any Design Tips or Ideas? Colour reproduction on the real silk satin & silk georgette will be intense due to our specialist priting method. As these are 100% natural fabrics, no chemicals have been used on the fibres. You could also opt for the polyblend fabrics for similarly rich colours. If opting for Mulmul Muslin, please note that this fabric has a naturally loose yarn, which can help give designs a slight rustic aesthetic. This does not in anyway impact the quality of the print, and merely adds to the natural charming qualities of the fabric. As Mulmul has quite loose yarns, you might find that there are slight colour and intensity variations. This would be apparent in parts where the tread is looser. We believe this natural attribute helps give designs a gorgeous, almost vintage finish. If you wish to order a size that's not currently listed, do pop us a query on live chat and we will be happy to make it happen for you. You can make your hijab collection so you have one to wear for any situation. Print vivid colours and patterns for a vibrant evening hijab and make it your statement accessory, or design a monogrammed headscarf featuring your name, nickname or favourite quote to express your beliefs and show off your personality. Another idea is to have hijabs themed, or the flag of any other country that you consider home. Treat yourself to a gorgeous personalised headscarf and save money when you buy a second. Custom printed headscarves allow to you express your individual style without compromise. Choose from 5 fabrics and different sizes.